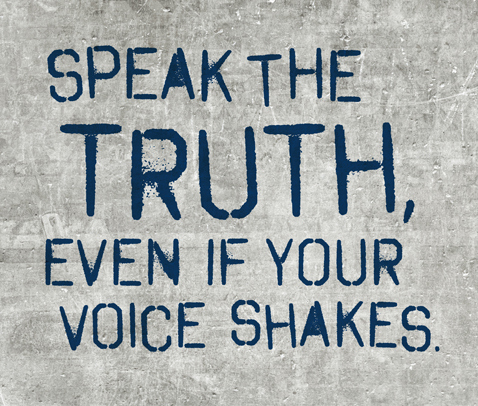 Truth that is missing important components of what makes it the Truth, is no longer the Truth. It’s like giving someone a formula to which you know the correct answer, but you erase a couple of the numbers that make up the formula before asking them to solve it. What happens? It causes the respondent to either a) become frustrated and confused, or b) fill in numbers of his own to come up with his own answer. I know that many Christians think some truth is better than no truth . . . but why don’t we give it to them straight, rather than side-stepping components that might be offensive (like Jesus is the only way to heaven, and there is a hell for those who choose otherwise). Eventually, they’re going to find out anyway (or at least, I would hope that would be the case if they’re attending a real bible-believing Christian church) and if that’s the deal breaker, they should have been told right from the git-go, rather than wasting their and your time playing stupid spiritual games. If, on the other hand, the popularity of an event is primarily because “Christians” just want to be entertained by a water-downed version of a Jesus that somewhat resembles the one they think they know, then that’s a whole other problem in and of itself.